After the Rapture, and for the first time since creation, no witness will exist on earth. Rather than leaving man to his sinful ways, God sends two witnesses with supernatural powers who spark Israel’s spiritual awakening. Most believe the two witnesses are Moses and Elijah who are sent to prepare the way for Christ’s return. After a successful ministry of 1260 days, covering the first half of the Tribulation, the two witnesses are killed by the BEAST (Rev. 11:7 – aka 10-King Caliphate) during the conquest of Jerusalem. 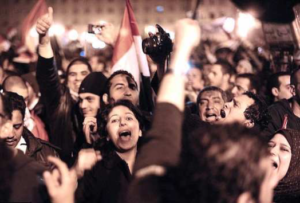 The details of their murder and the enemy’s response shine light on several distinctly Islamic practices that once again reveal a strong Islamic link to end time events in Revelation. Why would Antichrist leave the corpses of these two men in the streets for three and a half days? By doing so, it reveals the fingerprints of the Islam. This is a distinctly Islamic practice. Devout Jews prefer to bury the corpse as soon as possible, usually the same day but no more than 48 hours. However, in this case, the Islamic Empire finds themselves suddenly in control of Jerusalem after Antichrist breaks the treaty and launches a brutal assault on the West Bank and East Jerusalem in the middle of the Tribulation. 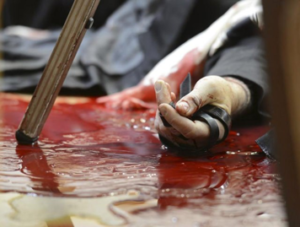 Glowing with success, the Turkish led Caliphate kills the two witnesses and sends the world a message. This is achieved by desecrating the bodies of the two men they hate the most. The two bodies are left exposed to the elements for 3 ½ days while the world dances and takes pictures that flash across social media and TV screens around the world. The two witnesses will be so despised by the Muslim world that the longer their bodies remain in the street the more of a mockery it is to them and their followers. Islamic fanatics take pride in the death of their enemies and refusing them a proper burial is a distinctly Islamic practice. Another time-honored Islamic tradition is seen in this passage with the practice of celebration after a terrorist attack. Who are these people that gloat over the death of the two witnesses? Are they Lutherans or Baptists or possibly Mennonites? Islam is the only religion in the world that celebrates the murder of religious leaders who don’t agree with them! 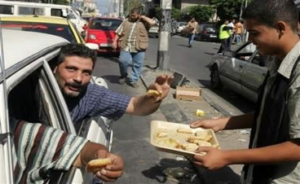 Passing out sweets and gifts after a terror attack is especially “sweet” whenever Israeli’s are murdered by Palestinians. Muslims give out candy and dance in the streets. Candy to children after Muslim Slaughters Jewish Family of Five, including an 11-year-old, a 3-year-old and an infant — all stabbed in their sleep. 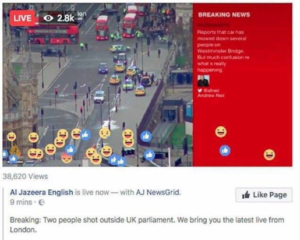 Viewers of Al Jazeera English’s live video feed of the attack reacted with smiley faced emoticons and thumbs up. In the screenshot below, just two of 26 respondents react with sad or angry face to the London murders. The media sugarcoats this barbarity but God’s word exposes it so THERE IS NO DOUBT CONCERNING THE ISLAMIC CONNECTION TO THE RELIGIOUS SYSTEM OF ANTICHRIST. 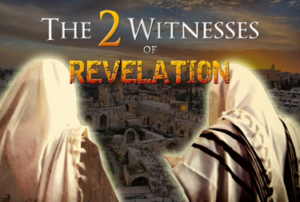 The shock will come when after three and a half days a voice is heard from heaven saying, “Come up here.” At the sound of God’s voice, the two witnesses resurrect and stand on their feet. 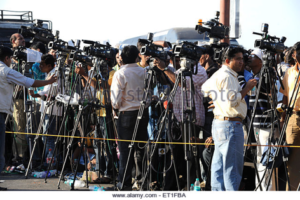 This, of course, is so all the world can witness the power of God in action, live and on camera. The events of the two witnesses reveal a strong Islamic link. For centuries, these verses have been read and studied without considering the question, “Why?” would the BEAST system keep the bodies of two dead men out in the open? And why would they celebrate in such an egregious manner? The answer is that these events are distinctly Islamic practices. They are practices Islam has observed for over 1000 years. Practices that God highlights in Revelation 11 so we would recognize them and realize the Islamic connection in the Bible to end time events. God is graciously warning the church of the Islamic hatred for Israel and the church and of their disrespect for God’s witness in the world. The church needs to wake up and take notice that the enemy is rising fast. Which means… hallelujah, Jesus is COMING SOON!